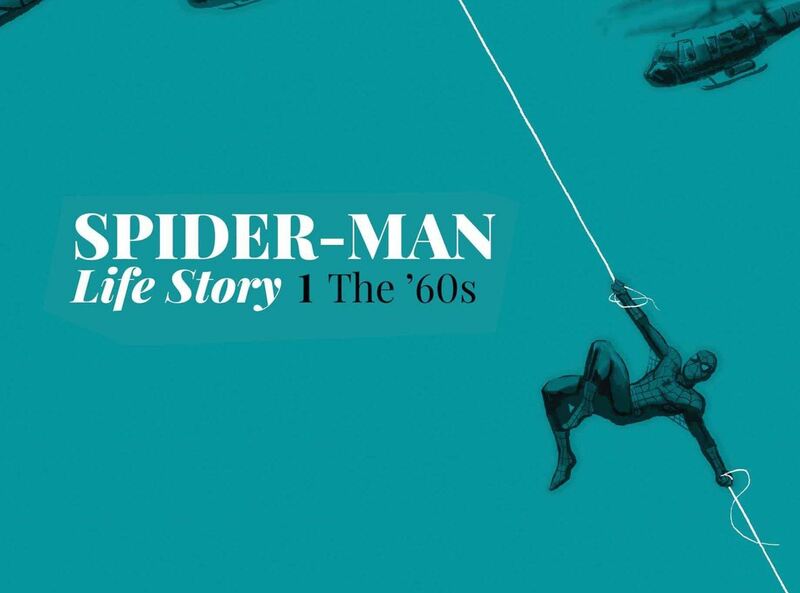 Spider-Man: Life Story #1 Review: A celebration of Spidey and the era of his creation – AiPT! A Spidey story with a 1966 kick. I gushed about Spider-Man: Life Story on this week’s AiPT! Comics podcast because the idea behind it is sound: explore a superhero character as if time moved forward like in real life. Spider-Man would have been in college in the late ’60s, for instance, and wouldn’t be the same due to the political climate of America at the time. Which is what issue #1 focuses on and why it’s not only a celebration of Spider-Man but the era in which he was created. This six-part series is celebrating Marvel’s 80th anniversary with a clever premise. It’s also drawn by superstar Spider-Man artist Mark Bagley. Nuff said. This issue takes place primarily in 1966, just a few years after Peter Parker was bitten by the radioactive spider. He’s now in college and the Vietnam War is taking over the news waves. Writer Chip Zdarsky eases us into this different time well, establishing different points of view on the war as well as the tensions of the time. A quick scene with Peter arriving at school shows protestors outside, or in another panel we see Harry Osborn wearing the clothes of the time and generally being anti-war. There’s a bit of ’60s lingo thrown in there too. Since the story is taking place in such a different period (Marve’s sliding scale timeline has affected current Spider-Man quite a bit) a few story elements have shifted. Peter’s relationship to Flash for instance, or even Gwen Stacey. It’s fun to see how Chip and artist Mark Bagley have subtly shifted the timeline. It makes one wonder if over the six issues the story will shift things in a butterfly effect. You can see that already happening with how two big-time superheroes are used in the narrative. Bagley’s art is great, but come on, what did you expect? He’s an artist who actually got me into comics, so the nostalgic vibes are strong with this one. He draws a great Peter, but also Spider-Man and the many references to the times. Inker John Dell and colorist Frank D’Armata join him and keep the superhero colors bright and shiny and the real-life scenes grounded and realistic. There’s a dark undertone in this book due to the shadow of the Vietnam War and it’s subtle enough to not be overt. I was taken a bit by surprise in how important a certain Avenger is to this story and the narrative. It’s certainly not bad, but given this is a Spider-Man title story it seems off base. Even the cliffhanger seems off in some regard due to this. It remains to be seen how the events in this issue will change things when we reach the ’70s next issue, but I hope things are a bit more Spidey-centric. A good first issue that establishes the main conceit of the series while dropping readers into the unfamiliar world of 1966. This is a celebration of Spider-Man, but also the era in which he originated. Zdarsky and Bagley have got themselves the cleverest of ideas here, most likely to be copied with future heroes. A good first issue that establishes the main conceit of the series while dropping readers into an unfamiliar world of 1966. This is a celebration of Spider-Man, but also the era in which he originated. Zdarsky and Bagley have got themselves the cleverest of ideas here, most likely to be copied with future heroes. In my mind Bagley can do no wrong as a Spidey artist. Plus he's backed up with great color and inks!